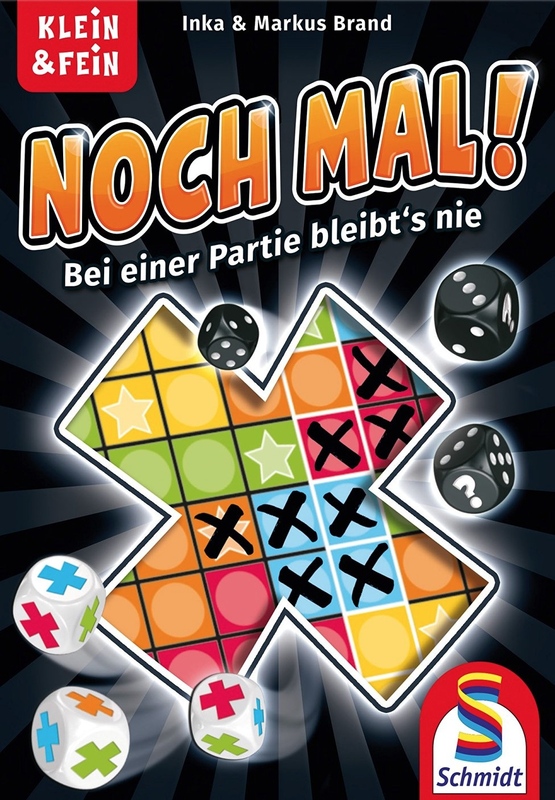 Unlike other games, in Noch Mal! (also called Encore! and Keer op Keer!) there is no theme. You are not a city designer trying to best fill a city with buildings, or planning the best route to a vacation destination, or anything else for that matter. In Noch Mal! you are simply trying to fill all of the boxes in columns and of similar colours before the game end is triggered. What is Noch Mal! like? Noch Mal! Is a roll and write game that avoids trying to tie in a theme, but instead concentrates on making an interesting game that excels at being exactly what it is and doesn’t worry about anything else. 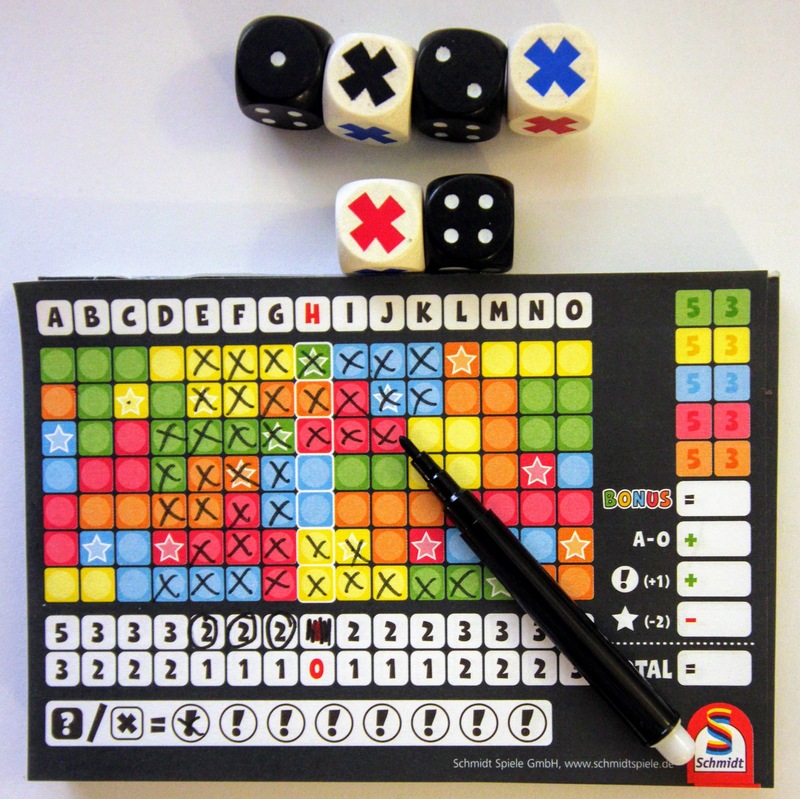 To play the game every player gets an identical play sheet and a marker while the starting player gets the 3 black and 3 white dice. The play/score sheet contains 15 columns and 7 rows filled with connected squares of 5 different colours (blue, orange, yellow, green, and red). The coloured squares can also contain a star symbol (3 per color). The white dice have one side each of an X of the 5 colours as well as a wild black X. The black dice are normal six sided dice except that one side has a wild question mark. A turn consists of a roll of the 6 dice and the selection of 1 black and 1 white die by the active player. The dice selected by the active player are used by that player alone while the other players get to use any combination of the remaining 4 dice. What is done with the dice that were chosen is where the strategy comes into play. The white die tells that player what colour squares they will be filling and the black die tells them how many of those squares can be filled. The only rules for placement are that the player must either begin in the center column (H) or orthogonal to an already filled in square and they must stay within the same group of coloured squares. A player cannot finish one set of squares and then move onto a different set of the same color. All of the number they selected must be placed in one grouping of the color they selected. The black X and question marks found on the dice are wilds so they can be used as whatever the player desires, but players only have 8 wilds available to use for the whole game and every one they have left at the end gives them a point. As the game progresses the players are looking to complete the columns and fill in every square of the same colour. If they are the first player to finish the column they announce what column was completed and they score more points than a player who finished that same column later. The same thing happens when a player finishes one of the colours. The only difference is; once one player fills in every square of a colour for the second time, then the game ends. When the game ends the players get points for finishing colours and columns and for every unused wild. For every square with a star not filled in players subtract two points. Whoever finishes with the most points wins! Noch Mal! Is a good, quick game that will probably go with me when I travel and will be a regular at my game group while we wait for other players to arrive. For such an easy game there are some strategic choices to be made, but most turns end up being a very simple choice. Noch Mal! does what it does well, but as I said earlier it doesn’t try to do too much so it can be played by just about anyone. Noch Mal! is a relatively easy game to learn and play. The rules are short and readily understood by most players. Even if the rules are not completely understood by a player the teacher can show all of their possible options quickly to help the players make their own choices. Inka Brand, Markus Brand, Noch Mal!